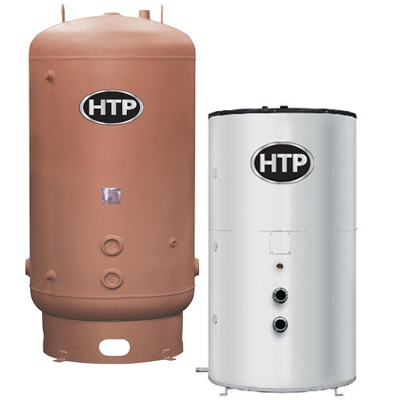 HTP’s Large Volume Storage Tanks are glass lined with a tough wear resistant coating to reduce the effects of high temperature hot water. This storage tanks are manufactured with 2” thick high density foam insulation to minimize heat loss. Magnesium anode rods protect that tank and allow for a longer service life. Tanks are available in either a jacketed and insulated option or a bare tank option. The Large Volume Storage Tanks are designed for storage of potable water up to 180°F. Glass lining is applied to the interior surface of the steel providing a tough wear resistant lining which minimizes the effects of high temperature hot water. The storage tanks are equipped with anode rods, for protection and longer service life. For full list of models, please view our brochure. All HTP Large Volume Storage Tanks are constructed and certified in accordance with ASME IV, Part HLW, for PSI (862 kPa). Red Oxide Primer is standard on all tanks. Top and coats and finish coats are also available. These tanks are manufactured with 2” high density foam insulation to minimize heat loss. Jacketed and insulated tanks have two ¾” aquastat NPT fittings located in the lower and upper part of the tank. Bare tanks have one ¾” aquastat NPT fitting located in the lower part of the tank. The Large Volume Storage Tanks come with a limited five year warranty, right out of the box! No registration is required. A limited ten year warranty option is available on steel tanks with double glass lining. *double glass lining is not an inventory option, but built upon request.